In the coming weeks, we will be releasing our most important update of the last 3 years. In this article we'd like to provide you with a short overview about the changes coming, the new Scrum Mate Model, and the effects of this update on your projects. How will the update affect my existing projects? 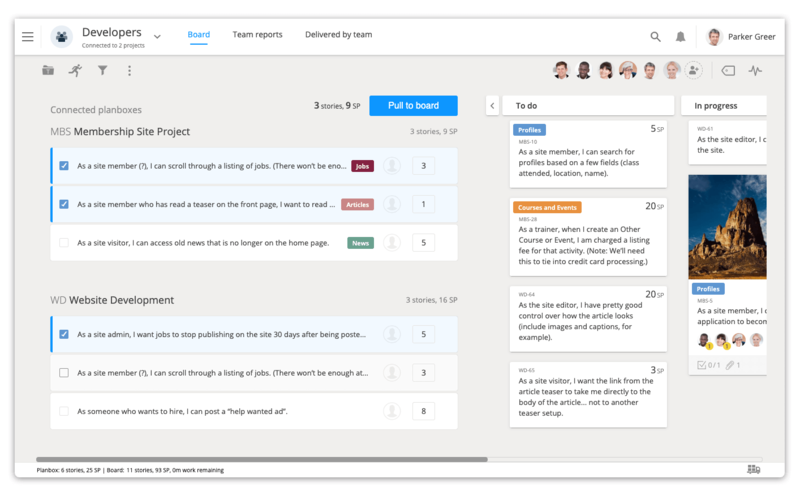 Our goal with the new version of Scrum Mate is to provide a great tool for product teams and teams working on multiple projects. We aim for this update to benefit solution providers working for many clients and agile business teams working on a variety of initiatives. The old Scrum Mate model focused primarily on product development teams and was organized around projects. The setup worked in such a way that a board was bounded to a single project. 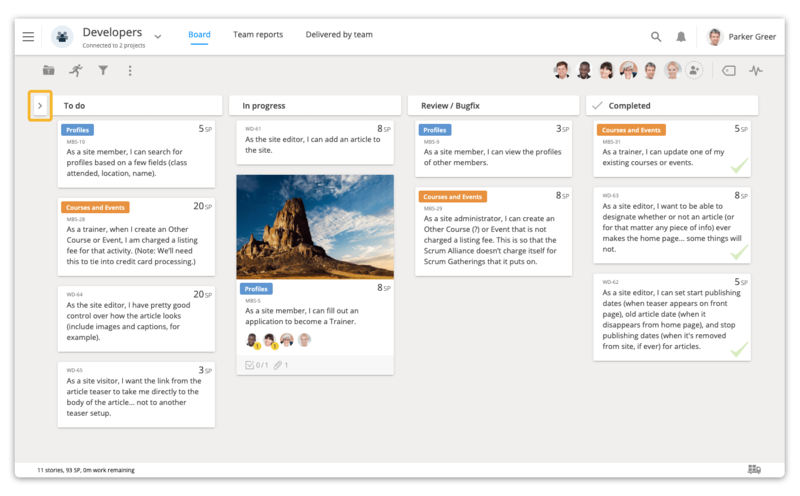 In our new version, boards will be independent from projects to allow teams to work on stories from multiple projects on a single board. This isn't just a simple change but the first step towards a whole new approach. We reimagined Scrum Mate to implement a simple, yet powerful model for agile organizations. The model is based on two cornerstones: projects and teams. Projects are goals or initiatives that are important to the organization. Projects are used to organize work into an actionable list of items that need to be delivered. Teams are self-organizing groups within the organization. They pull work from projects to their board where they collaboratively deliver results. 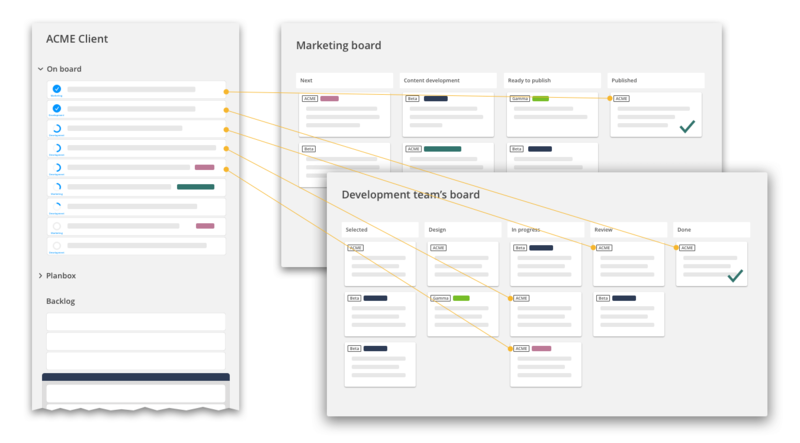 In the new Scrum Mate, a board is a workspace that represents the workflow of a team. In fact, boards are now called 'Teams'. A team can work on multiple projects, so a board can receive story cards from more than one project. In the new version of Scrum Mate, the backlog provides a unified view off all user stories that are not delivered yet. Even stories that are on a board. A section at the top of the backlog called 'On board' contains every story of the project that is on a team's board. The 'On board' backlog section shows stories in completion readiness order: the most progressed story will be at the top of the list. Besides providing an overview of the entire project, this setup comes with an additional benefit: you'll be able to share the product backlog with your clients, so they can get insights about the progress of the stories without accessing the team's board. Agile - and espetially Scrum - evolved in the product development environment where teams worked on a single product. The challenge when a team works on multiple projects is to avoid the chaos caused by conflicting interests of different projects that result in vague priorities and the loss of focus. To sort that out, we're introducing the planbox. 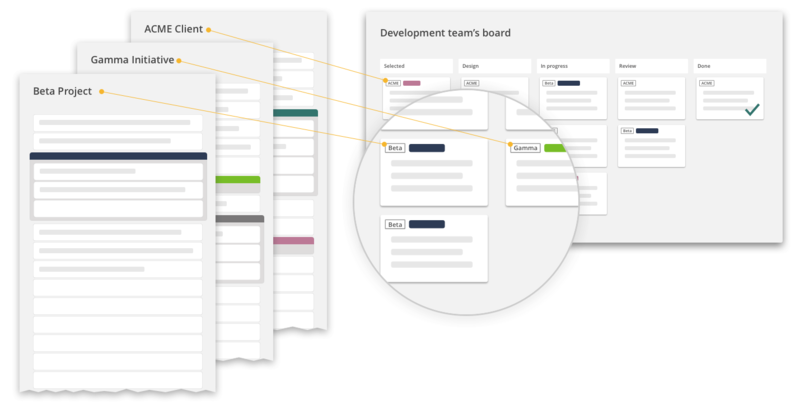 The planbox section in Scrum Mate provides a mechanism that helps product owners and agile teams to implement a clear method for proiritizing and selecting work that needs to be completed. 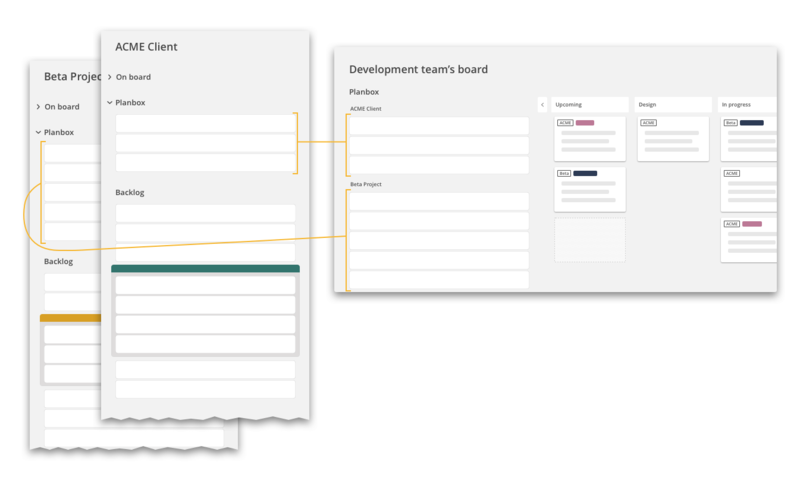 User stories in the Planbox section are visible from the connected boards, so teams can easily pull stories from the planbox onto their board. Product (or project) owners can now place the stories they want the team to work on next into the planbox. The team can review the planbox section of all connected projects and select items they can commit to start working on soon. How will the changes affect your existing projects? 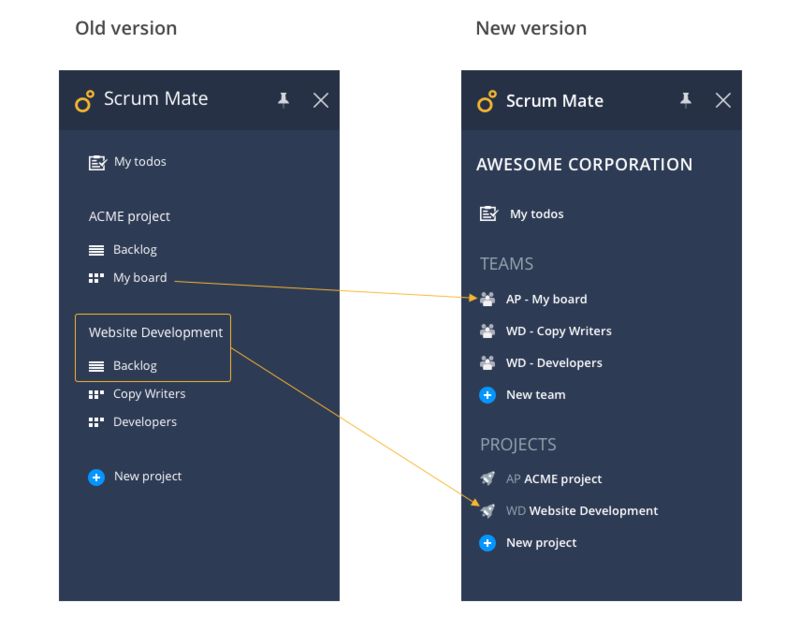 Although the update impacted the entire Scrum Mate model under the hood, our goal was to keep the look and feel of the application as familiar as possible. However, some changes were inevitable. We collected the most important changes you will immediately see when you first meet the new version. As boards become independent entities from projects and we refer to them as Teams, they will get an independent section on the left navigation panel. All boards are relocated to the Teams section. During the version upgrade, Scrum Mate will add a short prefix to the name of your existing boards to help you identify which project was the originator of team. Scrum Mate will add the project ID as a prefix to former board names. Example. A board formerly called 'My Board' in the project 'ACME Project' will be renamed to: 'AP - My Board', where the 'AP' id is generated from the first letters of the words of the project name. Organization owners and admins can easily rename teams later. There is a change in how navigation between boards (now: Teams) and projects work. As boards are no longer part of a project, they are removed from the project's menu on the top navigation bar. The boards that were formerly part of a project are now teams connected to the project. You can switch between projects and connected teams by clicking on the workspace name. When you navigate to a team page, you can see its own delivered items view and reports view besides the boards view. The delivered items list contains the user stories delivered by the team. Under the reports view, you can access the progress charts (burn-down chart and cummulative flow chart) and the report of closed sprints. From a team view, you can navigate to the connected projects and to fellow teams working on the same projects as the current team. When you open the backlog of a project, you'll find two new sections, called 'On board' and 'Planbox'. When you expand the 'On board' section, you can see all user stories that are on a team's board. Stories in the 'Planbox' section are accessible from the team's board. From the Team's board view, you have direct access to the 'Planbox' section of connected projects. You can drop stories from the planbox to the board one by one, or you can select and pull stories in a group. The new model allows you to connect many projects to a team. To connect additional projects to the team, select the 'Connect / disconnect projects' from the workspace menu, under the 'More' section.